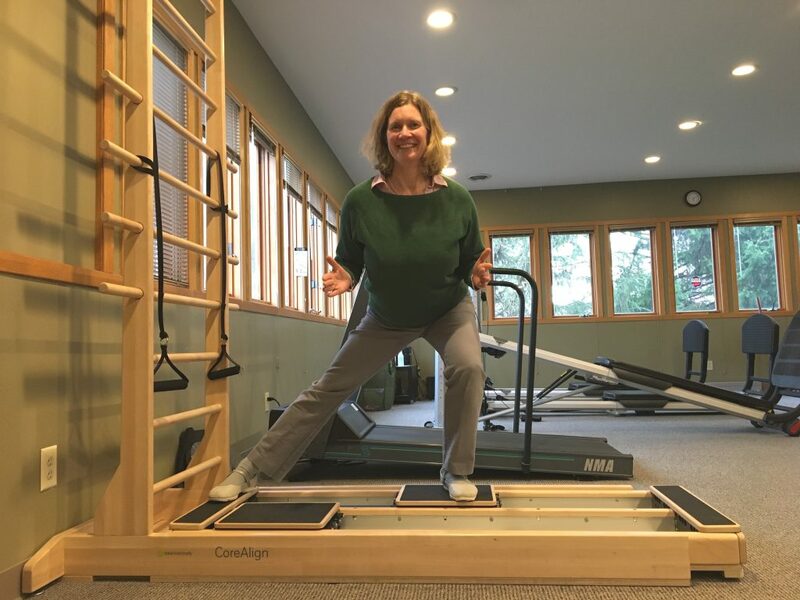 OwnerLynn Batalden, DPT, Orthopedic Clinical Specialist, recently attended a CoreAlign workshop to learn how to use our CoreAlign equipment more effectively. The three-day class further confirmed Lynn’s high opinion of this equipment to be used for all types of clients. The equipment is sold through Balanced Body, a Pilates-based equipment and education company and was invented by a physical therapist to improve people’s ability to walk and run. Here at Creative Therapeutics, we have seen firsthand that when we use this machine with our clients they can immediately walk better. This is accomplished through the resistance bands that stimulate the muscles and the nervous system in walking patterns. It provides an instant feedback loop to increase core engagement in a way that the participant can really feel. There are fun, high-level exercises that can challenge the athlete not only for increased strength but to change recruitment patterns in critical muscles for efficient movement which is essential to endurance and injury prevention. Lynn uses the CoreAlign both with her physical therapy patients and to train private clients. This entry was posted in Physical Therapy, training, exercise, Personal Training and tagged Running, creative therapeutics, core strength, lynn batalden, corealign, core exercises, walking, core align. Bookmark the permalink.